India is celebrating 71 years of Independence today. 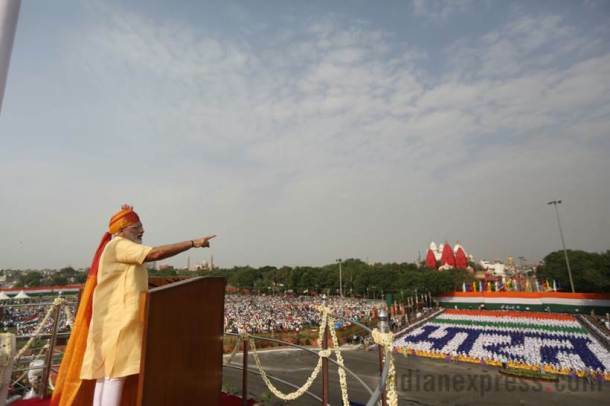 On occasion, Prime Minister Narendra Modi today hoisted the tricolor for the fourth time and addressed the nation at the Red Fort in the national capital. Narendra Modi is the first prime minister born in independent India. In his speech, Modi lists out his vision for the nation in an hour long speech. Everybody is equal in our country, no one big or small. We together can bring a positive change in the country. We have to take the nation forward with the resolve of creating a ‘New India,’everyone must drop this ‘Chalta Hai’ nature. We have to now think of ‘Badal Sakta Hai’- it will help us progress as a nation. PM Modi talked surgical strikes. The country’s safety remains our priority; our forces have always shown their mettle, you will be glad to know that we are not solely in our fight against terrorism, many countries supporting us actively. Modi mentioned Kashmir’s progress is everyone responsibility, He added that GST had shown the meaning of cooperative federalism. The country has come together to support GST, and the role of technology has also helped. The national capital has put under a ground-to-air security cover. Thousands of security staff, including 9,100 personnel from the Delhi Police, have been deployed in and around the Red Fort, overseeing the presence of top dignitaries, including politicians, bureaucrats, diplomats and the general public, attended the PM’s address and Independence day celebration.